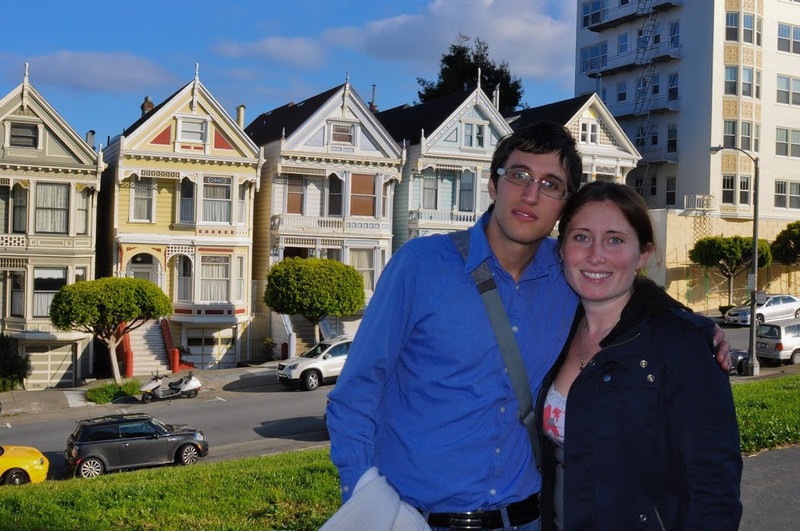 Daniele and I started our California trip off in San Francisco. We flew in Thursday, November 10 and stayed until Monday the 14th. My friends Chris and Lori very graciously offered for us to stay with them. We were running four hours late from Philadelphia, so we didn’t get to anything I had wanted when we arrived. We ended up dropping our stuff with Chris and going with him to meet Lori and a Italian / Canadian friend of theirs, who happens to be fluent in Italian. So that worked out nice. We had some drinks at Cigar Bar and then went to China Town for dinner. Daniele really liked China Town. I wanted to get all the “touristy” stuff I know all my friends are sick of over with on Friday while they would be working. My first choice for breakfast had a line around the building, so we ran over to my old neighborhood, Lower Haight and went to Kate’s Kitchen. That was delicious of course! Then we took the N train over to the Ferry Building. We passed by Occupy SF, they had a nice showing. Later we would see people in tents in L.A. and Daniele asked if they were protesters. I wasn’t 100% sure, but I think they were just people living in tents. Anyway. We walked though the Ferry Building before hopping on the F train to Peir 39. 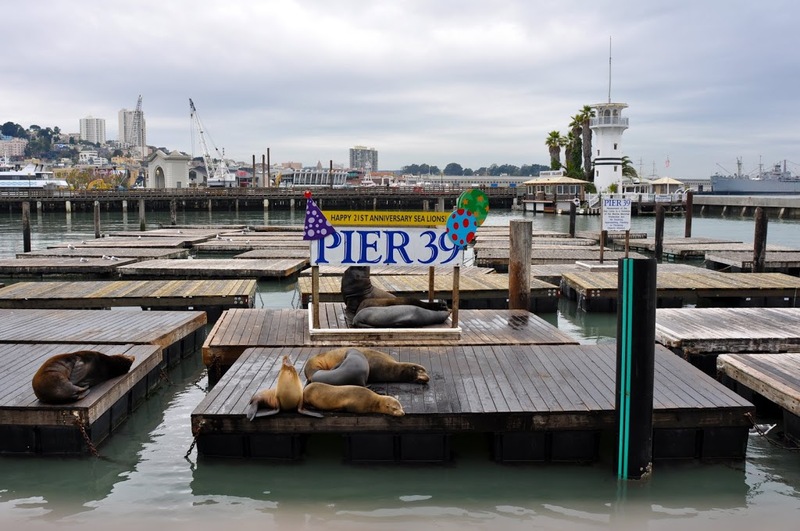 There we did all the usual tourist stuff, the shops, seals, waterfront, Ghiradelli Square. After we went to North Beach. Daniele was excited about North Beach, but we didn’t see that much because the on and off light rain we had been having all day got pretty serious here. We stopped at Chris and Lori’s for dry socks and to change up between day and night clothes. Then we met up with two of my favorite people, Marc and Jeani for a happy hour and Jenkins Brew House. It was a pretty cool place; they always know the cool places. After that we met an old work friend Steve and his new girlfriend for dinner at Farmer Browns. I had wanted to bring Daniele to a Soul Food restaurant for a long time as an example of a type of “American” cuisine and my attempt in NYC had been a terrible failure. After all that, he was not very impressed. It was probably over hyped. He liked my friends, though. This day my plan was to cover on foot some real neighborhoods of San Francisco. We managed to cover Mission, Castro, both sides of Haight, and Hayes Valley. Needless to say, my calves were getting pretty sore at this point. We started in the Mission. Part of the reason for that was I wanted to bring him to a place that serves Blue Bottle Coffee (since he is Italian and therefore an expert on coffee). I really like Blue Bottle and wanted to get some while in SF and I wanted to get some for him to show him Americans make good coffee. Four Barrel is one of the few cafes I know that serves it, so we went there. It was a Saturday morning in SF, so of course there was a line from the cash register to the door. In Italy there are no lines; people just crowd by the registrar or barista and yell their order. I’m not sure he had ever seen such a thing and he put up quite a fuss. But I held my ground. I said I was going to wait in this line and he could do whatever the f* he wanted, minus continue to make a scene. Five minutes later all the people in front of us had been served and we had delicious coffees and donuts. There was a little confusion as Daniele apparently wanted an American style coffee (opposed to espresso) and accidentally ordered and “Americano”, an espresso drink with hot water added made popular in Italy by American Gis from WWII. But everything was delicious. After we walked around aimlessly in the Mission area. Lastly checking out Dolores Park. From the park we easily wondered into the Castro. We just walked up Castro Street and absorbed the ambiance. From there we went up to Buena Vista Park, and then Upper Haight. We did a quick circle through Upper Haight and hit up Alamo Square on the way down to Lower Haight. Daniele was not very impressed by the painted ladies and found it much more interesting why so many people were taking pictures of these four houses. Daniele was really anxious that we had been on the west coast for almost 48 hours and still had not eaten Mexican food. So we stopped at one of my old favorites, the Little Chiwawa on Divisadero and Page. They have some yummy unusual flavors like a plantain and cheese that I got. After that we walked through my old neighborhoods, Lower Haight, we had seen it a little at breakfast the day before, then continued to Hayes Valley. There we got dessert: macarons from Miette that we enjoyed in the little park in Hayes Valley along with some people watching. After that we regrouped before heading to Marc and Jeani’s. They had moved to a new apartment since I had left and it’s beautiful! I had organized a dinner of my old San Francisco friends tonight and we met here first for some wine and cheese. 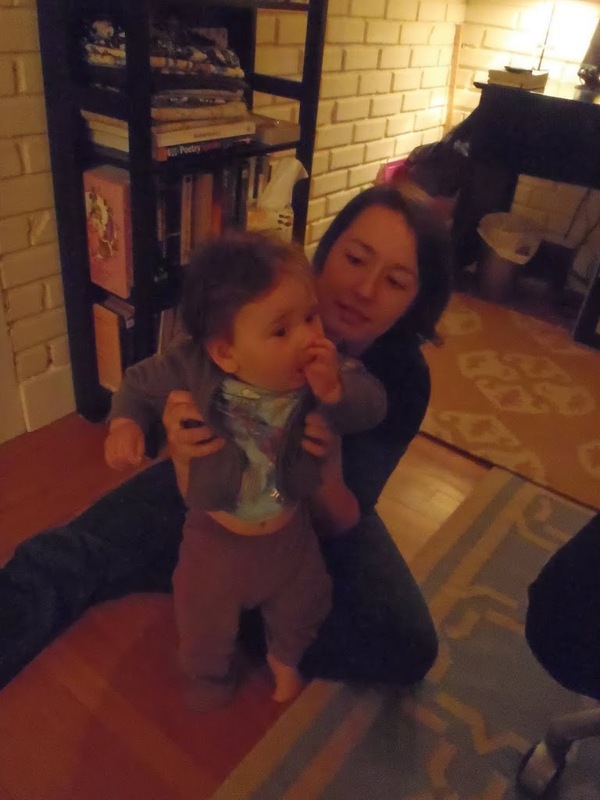 I also got to meet Simon, Michelle and Billy’s beautiful little baby boy! He’s a fast mover though, all my pictures of him came out blurry. But such a good baby! He played around, let anyone hold him, and during dinner just sat quiet; you could forget he was there if he wasn’t so cute. From Marc and Jeani’s we went to Kan Zaman, one of my favorite places: delicious hummus, babganush, falafel, and other yummy things, also belly dancing, and there used to be hooka but apparently SF started cracking down on hooka bars because it’s considered “smoking”. The belly dancer gave me a lesson. So that video exists. Chris, Jenna, Daniele, and I had another round at Mangolia after, too. It was so nice seeing all my friends again!!! Our last full day in SF Daniele and I rented bicycles to go around Golden Gate Park. The best rentals I found were from Sports Basement in the Presidio. That worked out great because it is near Ella’s, a great breakfast place. 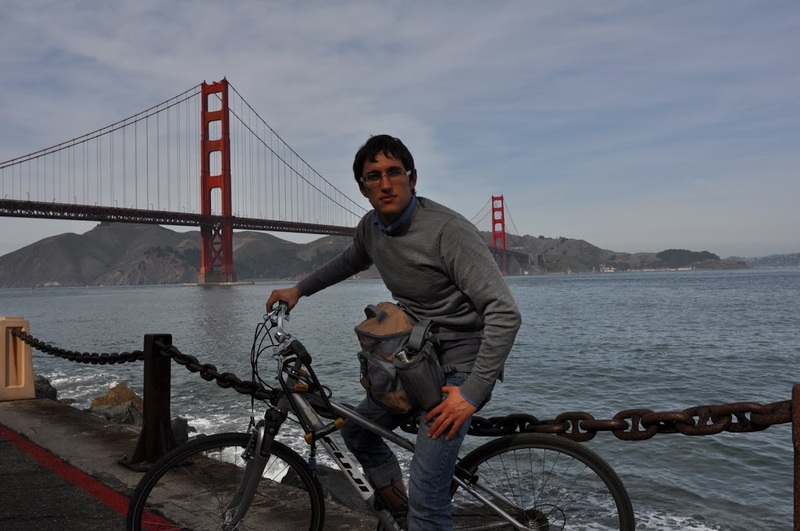 It’s also very close to the Golden Gate Bridge, so we did that as soon as we got our bikes. We just went halfway and took some pictures. We didn’t want to lose too much time since the real objective was the park. We also had to ride through some of the Presidio Park and some hilly streets between the bridge and the park. 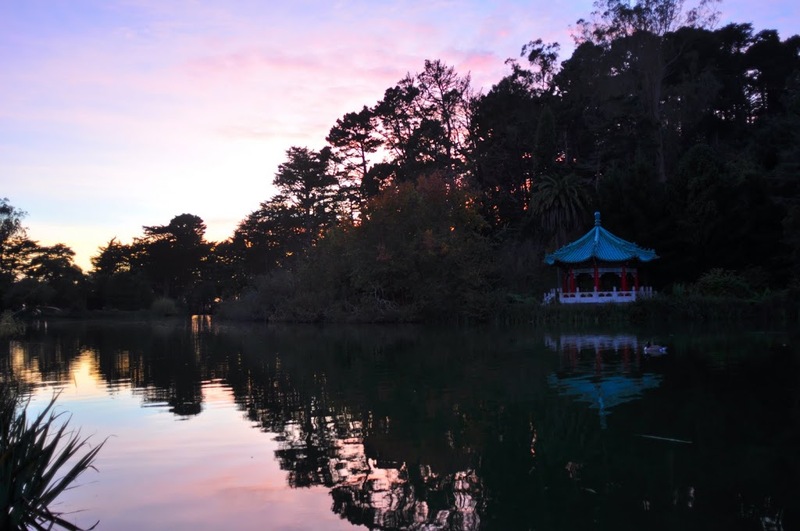 I have been to Golden Gate park 100 times, but never saw the things we did this day. We went and saw the Bison, the Chinese Pavilion, the Dutch Windmill, and a little of Ocean Beach. In between we grabbed a quick lunch at a vegan place in the Richmond, which was OK. As it started getting dark we started heading back to return the bikes. By the time we made it there we were riding under under-construction overpasses in the dark. Neither Daniele nor the guy at Sports Basement when I asked if there was a different way out seemed to think this was sketchy. But it was. It was very sketchy. Daniele and I wanted to take Chris and Lori out to dinner to thank them for hosting us, but Lori was still not back from LA, so the three of us went to The Front Porch. The food was pretty tasty and it was the first time I had warm breaded goat cheese balls in a salad, which I guess is a thing now. Highly recommended. Monday morning we left pretty early to pick up our rental car and start our drive down the coast. I’ll leave that story for next time. Amazing trip you guys did there! Your pictures look wonderful as usual! I just want to mention I’m all new to blogs and actually enjoyed your blog. Likely I’m want to bookmark your blog . You certainly have perfect well written articles. Bless you for sharing your web page. Extraordinarily insightful data that you have stated, thanks for publishing. An outstanding share! I have just forwarded this onto a co-worker who had been conducting a little research on this. And he actually bought me dinner simply because I discovered it for him… lol. So allow me to reword this…. Thank YOU for the meal!! But yeah, thanks for spending time to talk about this issue here on your blog. We simply have to tell you that I am certain beginner to wordpress blogging and genuinely liked your report. Very possible I am most likely to bookmark your webpage post . You simply have excellent article text. Value it for share-out with us your web article.